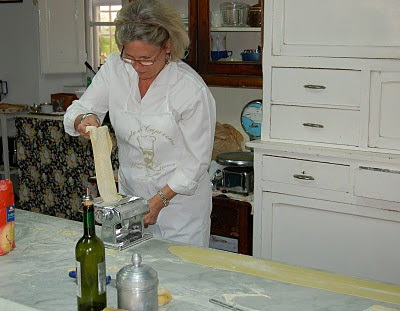 Getting down to the basics here.......and that fantastic pasta machine! Never in my wildest dreams did I think I could do this, making pasta from scratch, but I had some great instruction and fresh range eggs! Use a small frying pan and lightly brown the walnuts, about three minutes, moderate heat. Let the walnuts cool. Process the walnuts and parsley together until finely chopped and blended and then add the butter. Mix. Gradually add the oil in a steady stream while processing. Add the garlic, cream and then Parmesan. Salt and pepper to taste. Cook pasta according to directions, al dente, drain and toss with sauce. Serves four.